Haven't done one of these in a while, and coincidentally both of the items are work related. Yesterday I rang up a customer who bought a small journal to add to his collection because he uses them to "jot things down at work all the time". I heard that and didn't think anything about it, until he continued to tell me that he's a chef, he used to work for The Food Network, and he's trying to spread love for bacon and cooking around with his new book, Bacon Man!. 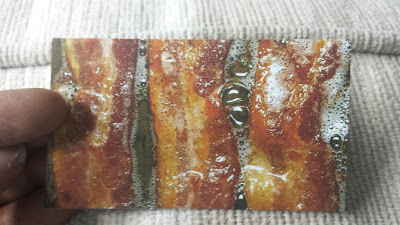 He even made a point to show off his faded bacon wallet, which I hadn't noticed at first. Then he handed me this card promoting his book before thanking me and leaving. Now, I'm not much of a bacon enthusiast, and since I don't have the Kindle app I probably won't be checking out this book as I'd promised. But that's no reason for y'all not to, if y'all are interested! It's cheap ($1 ebook), and contains 20 recipes−ranging from breakfast to dessert−all of which include bacon! 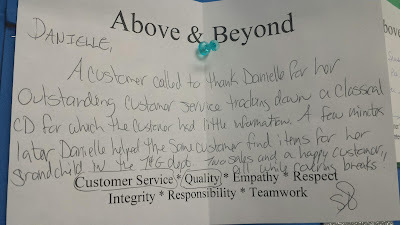 I'm sharing this because I liked the clear photo of bacon sizzling used for the card, and because I appreciated this customer's pleasant attitude and tenacity. Thanks Jay, and good luck to you! The next one is pretty self-explanatory, just read the note below. Every week someone on the bookstore staff is recognized by a co-worker for demonstrating any of the seven core values listed at the bottom of this nomination form. And I guess this week was my turn! Thanks, Steve! 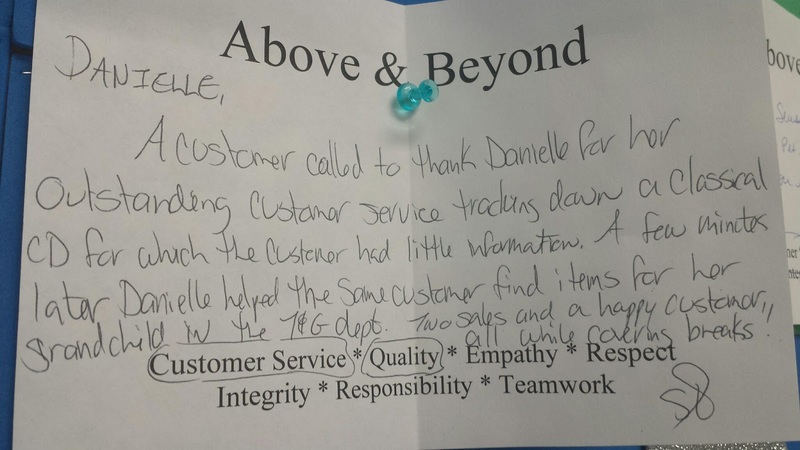 And thanks to the lady I helped last week who called! It's not too often that we get people calling just to say good things, so you are very much appreciated!